joined our Affiliate Sponsor program as part of Tyler Pipe & Coupling’s renewal for the coming year. developed a section on its website devoted exclusively to Affiliate Sponsors (aspe.org/affiliates). says Brian Henry, ASPE’s Director of Affiliate Relations. application of advanced techniques throughout the world. For additional information visit www.aspe.org. McWane, Inc. is a family-owned business based in Birmingham, Alabama, with companies across the United States and the world. 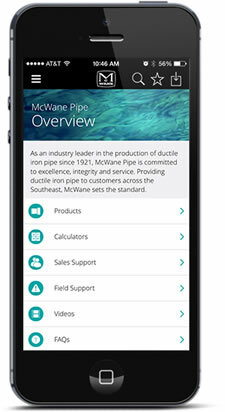 At the McWane Family of Companies, we cast ductile iron products--including pipe, valves, hydrants, fittings, and plumbing products--manufacture fire extinguishers, fire suppression systems, steel pressure vessels, and build network switches and monitoring equipment. We are the leader in delivering clean, safe drinking water around the world while focusing on the safe, environmentally-friendly manufacturing of our products. With more than 6,000 team members McWane has a longstanding commitment of support to the communities where we live and work.